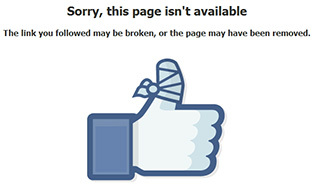 Facebook has deleted its page of ExtraTorrent due to claims from copyright holders. Moreover, profiles of the administrators got also removed and all ExtraTorrent related URLs are being blocked as a security precaution. It doesn’t come as a surprise that Facebook has to comply with the copyright laws. Therefore, it needs to delete all URLs that violate any of such laws. In rare cases Facebook can delete the whole business page that is believed to violate just too much. This is what happened yesterday to ExtraTorrent. In fact, they hadn’t shared any torrent links for a year already, but copyright holders were still very eager to send takedown notices. The most active was IFPI, a known music industry company. The accusations worked at last and the page with tens of thousands of fans was removed. But this was not it. Fans started to create new pages on themselves but all of them, roughly 500 pages got deleted by Facebook. Additionally, user accounts connected to ExtraTorrent’s page got disabled as well. The operator of the page who has no access to Facebook anymore, thought the URLs of mirror sites and official site on their Facebook page became fatal to it. Now posting an ExtraTorrent link on Facebook asks for a security check. Same thing applies even for private messages. ExtraTorrent has told to ignore social media for now. Without any irony you can share this post with your friends on Facebook.